FOX has announced the return of Brooklyn Nine-Nine to its Spring schedule with a move back to Sunday nights. The show will return Sunday, March 18 at 8:30/7:30c after The Simpsons. Paul Adelstein (Prison Break) reprises his role as Seamus and Marc Evan Jackson return as Kevin in the episode, "Safe House". Safe House - After Seamus threatens Kevin, Holt devises an elaborate plan to hide him in a Safe House, with Jake as his guard. Kevin is miserable as the 99 works overtime to find Seamus and take him down in the all-new "Safe House" episode of BROOKLYN NINE-NINE airing Sunday, March 18 (8:30-9:00 PM ET/PT) on FOX. 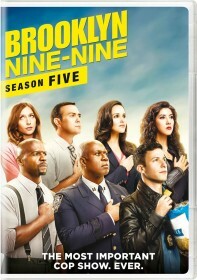 Brooklyn Nine-Nine's future beyond this fifth season is still up in the air and might not be clear until FOX's Upfront presentation in May. FOX is rumored to be moving its line-up towards more sport and reality programming after 21st Century Fox announced a deal to sell most of its entertainment assets, but not the FOX network, to Disney.